Mr. Imagination embodied art and the creative spirit. The third of nine children, he was born on the South Side of Chicago in March 1948 as Gregory Warmack. While living there, he was seriously wounded in a shooting, and during his near-death state felt he was whisked across time and space, where cultures and civilizations revealed themselves to him in a way that he now translates into art. I would love to think that he is now happy in those fantastic worlds that were revealed to him all of those years ago. Home with the kings, and Pharoah (his beloved dog) and all things of great beauty. Both prodigious and prolific, the incredible world of Mr. Imagination is “a work of art in progress.” Mr. Imagination’s talent was such that when handed an object, he saw in it things that the rest of us couldn’t see. This extraordinary gift allowed Mr. 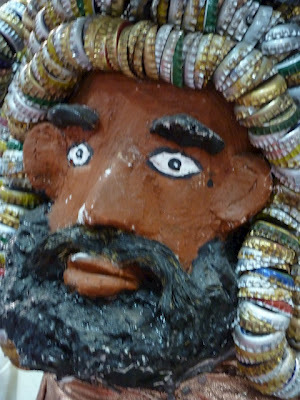 Imagination to transform common material into resplendent objects of art with new life, vitality and meaning. 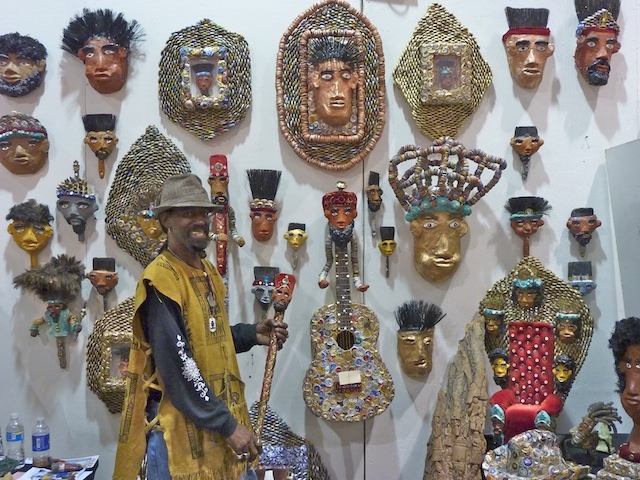 In 2002, he moved to Bethlehem, PA to create art near his friends at Lehigh University. 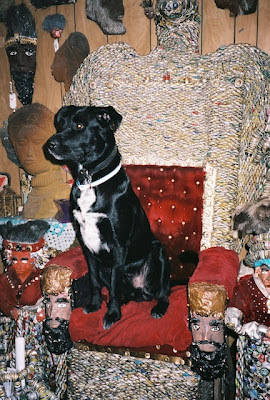 Seven years later, he experienced a devastating house fire destroying his home, killing his beloved dog Pharaoh and charring much of the work he had stored there. Like a phoenix rising from the ashes, he salvaged what he could to create new work. In August 2009, he relocated to Atlanta, GA. With the help of many friends, Mr. 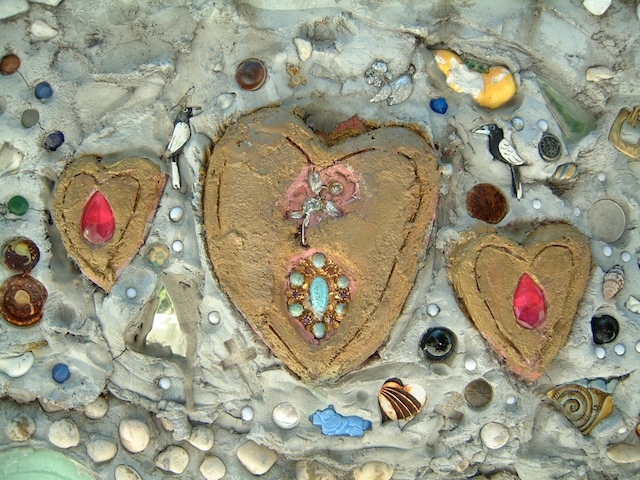 Imagination bought a home to create an Angel Garden for all the children and artists of the world to come together and bring artistic life to everything that has been thrown away and discarded. Also in 2009, Intuit presented Mr. Imagination with its Visionary Award in celebration of his incredible persistence, vision and contributions to self-taught and outsider art. His work attained national and international recognition. He also was committed to inspiring communities with a series of outdoor embedded concrete sculptures (or “grottos,” as he calls them). The ever-active Mr. Imagination was commissioned by the city to build a memory wall outside the offices of the Winston-Salem Transit System. 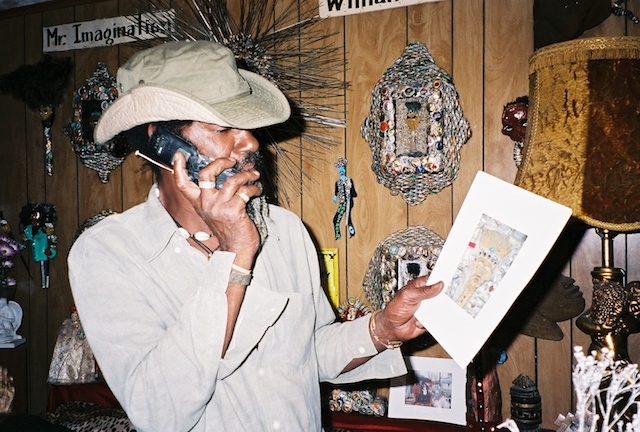 Residents were invited to bring mementos and artifacts from their own lives that Mr. I could incorporate into a concrete wall and bench located near one of the busiest bus stops in town. detour art travels: AVAM goes to Bergdorf Goodman!!! After the Salina City Commission rejected Mr. Imagination’s installation — grotto sculptures on downtown planters — local artist Katy England said she and Mr. 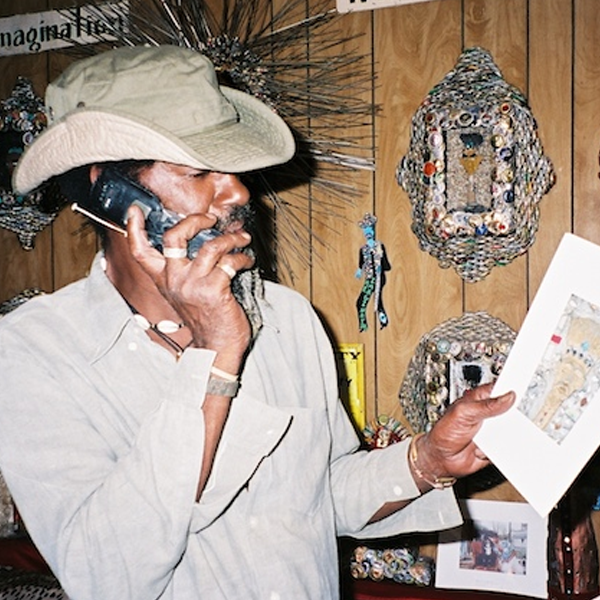 Imagination, also known as Greg Warmack, are forging new plans. other post from you Great Job! Hi Marylnne – Yes, he died yesterday from complications caused by an infection. It is really quite sad.